Like Ray Charles, Johnny Cash, and Wolfgang Amadeus Mozart before him, music icon James Brown will shortly be getting his very own glossy biopic. 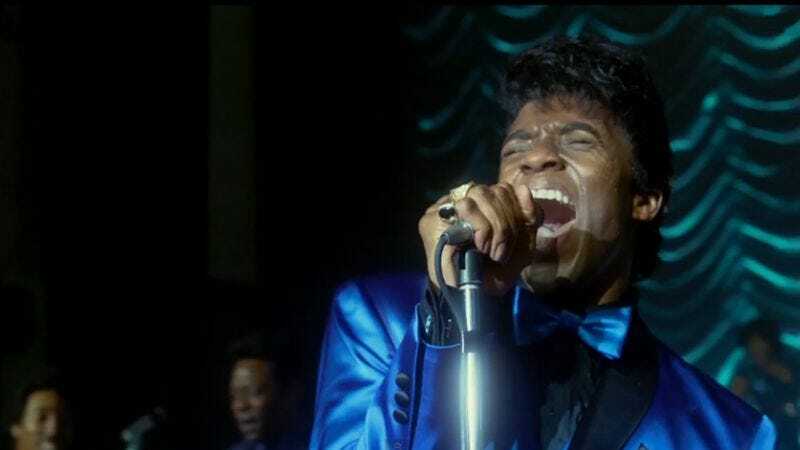 Universal has released the first trailer for the upcoming Get On Up, which features Chadwick Boseman as the charismatic Godfather Of Soul and a bunch of people who starred in director Tate Taylor’s The Help as his relatives. Dan Aykroyd, who personally received divine inspiration from the real James Brown in 1980, will play the singer’s longtime talent agent Ben Bart, and Craig Robinson can be seen quietly portraying a saxophone player around the 1:11 mark. The movie will trace Brown’s rise from the depths of poverty to the heights of the music world in the ’60s and ’70s. The musical numbers, which will have to be pretty impressive if they want to measure up to Brown’s reputation as a live performer, will employ a blend of Boseman’s own singing overlaid with Brown’s actual voice. Viewers can see whether that method pays off when Get On Up is released on August 1.